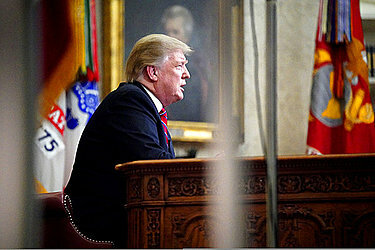 WASHINGTON (AP) — President Donald Trump made a somber televised plea for border wall funding Tuesday night, seeking an edge in his shutdown battle with congressional Democrats as he declared there is "a humanitarian crisis, a crisis of the heart and a crisis of the soul." Trump called on Democrats to return to the White House to meet with him, saying it was "immoral" for "politicians to do nothing." Previous meetings have led to no agreement. Trump has been discussing the idea of declaring a national emergency to allow him to move forward with the wall without getting congressional approval for the $5.7 billion he's requested. But he did not mention that Tuesday night.